The Coliseum Area Specific Plan also includes areas that surround the proposed Coliseum City project. A massive, 25-year plan for developing a big swath of East Oakland, from the Coliseum to the airport, will go to the Oakland City Council on March 31. But the plan looks very different from the first draft issued by the city last August. Planning commissioners credited the changes to feedback from community groups and public agencies. "Thanks to the leadership of dozens of residents, workers, faith leaders, and youth, the plan has evolved significantly," said East Oakland resident Reverend Damita Davis-Howard, a member of Oakland Community Organizations (OCO). The plan, Davis-Howard continued, now "incorporates elements of our vision of good jobs for local residents; affordable housing, especially for families, and measures to stabilize neighborhoods and contribute to a cleaner environment." 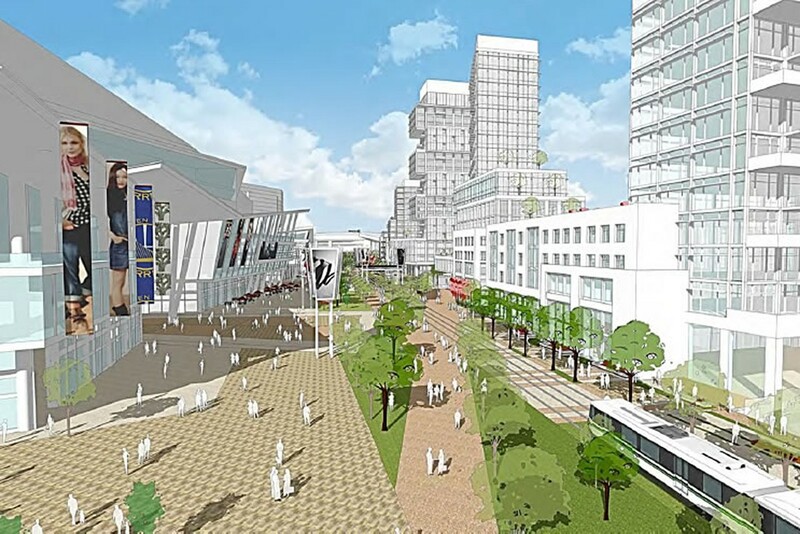 The first draft of the Coliseum Area Specific Plan included a projection of "up to" 20,000 new jobs over a twenty- to twenty-five year period, but made no mention of affordable housing. The original plan also gave scant attention to nearby communities. 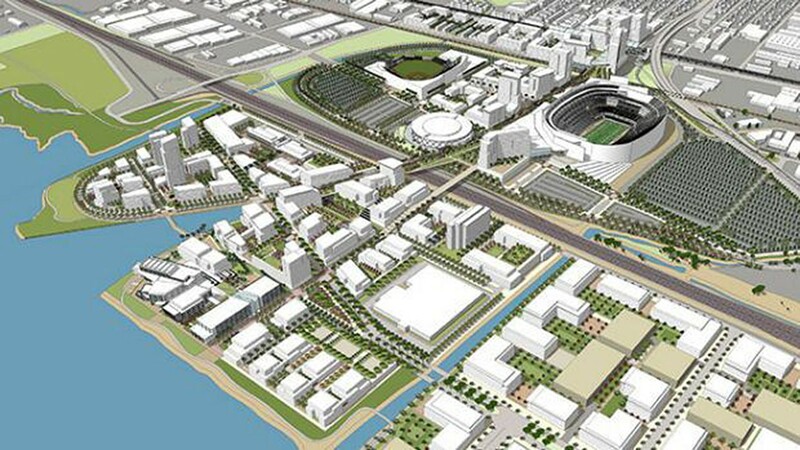 Most media attention to the Coliseum area has focused, not on the public planning process, but on the private negotiations that the city is holding with developers and sports teams to build Coliseum City, a mega-project that also would include hotels, housing, retail, and restaurants and bars. "The main goal is for us to keep our sports franchises playing in that space," said Councilmember Larry Reid, whose district includes the Coliseum. Both the A's and the Raiders want new facilities, but Mayor Libby Schaaf has said repeatedly that no city money will be used to build sports venues. Public money to pay for the necessary infrastructure will come from funds earmarked for transportation-related projects, she said. But Reid explained that the city can entice a developer to put money into new sports facilities by offering the opportunity to develop the adjacent land into a new "vibrant, urban, mixed-use community." 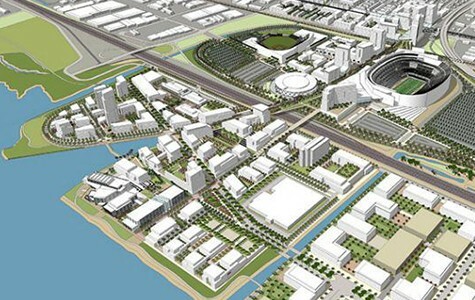 Coliseum City is to be built within the larger project zone known as the Coliseum Area Specific Plan. When the city released the Coliseum area plan, community organizations and unions started talking with East Oakland residents and Coliseum workers. Residents who heard about the plan had mixed reactions. "I live less than a mile from this beautiful project," said Nehanda Imara, an organizer for Communities for a Better Environment (CBE) "If it's done right it can transform the community and be integrated as part of East Oakland." Many neighbors welcomed the long-needed investment. But many also shared Imara's concern that the first version of the plan "felt like it didn't include those who live [nearby]," that the development would be an "alien space city" plopped down in East Oakland. "We don't want to see, 'We're here now, let's move you out,'" said Towanda Sherry, a neighborhood resident and member of Causa Justa/Just Cause (CJJC). "We want the developers to see the community as an asset. East Oakland has a lot of creativity, a rich culture. It's important the Coliseum City supports that." Johnny Stake, a member of Hotel Employees and Restaurant Employees Local 2850, has worked at the Coliseum for 33 years. No matter who ends up running the sports venues, he said, "We want to keep our jobs, our seniority, to make a decent living. We want to make sure the jobs remain good, union jobs, and the new hotels will be staffed by union members." Stake also lives in the neighborhood. "We want current residents to be able to stay there and new development to be affordable for low-income households," he said. His concerns were echoed by a group of high school students who have been studying the plan. One student, Jennifer Franco, explained that "with more people with money coming in, [landlords] might want to raise the rent. That might drive current East Oakland residents to other places." Another student, Javier Barraza, added that "local businesses should get the contracts" to build the development. His classmate, Emmanuel Barraza, said new retail districts should include local stores. "If big corporations make the money it's not going to go to Oakland," he said. "Money going to local business helps our community." "As they build their city, we'd like to get low-income housing for this area — in our price range," said local resident Theola Polk of East Bay Housing Organizations (EBHO). "Some things that are called affordable housing are not affordable by the average person making $12 an hour." The median household income in the census tract including the Coliseum is $31,600 a year, and many residents already struggle with housing costs. Building affordable housing close to BART also has environmental benefits, according to a new study by TransForm and the California Housing Partnership Corporation. The report shows that lower-income people living near transit take public transportation more and are more likely to give up their cars than those who can afford market-rate housing. Development in the area around the Coliseum is actually only the first part of the Coliseum area plan. "The plan is not the project. The plan is very long-term. It's a vision," Mayor Schaaf said in an interview. The plan also includes an ambitious goal of building a "regionally significant jobs and employment center" including a new science and technology district on the bay side of the 880 freeway. Residents who attended community briefings about the project asked for policies ensuring that some of these new jobs would go to Oakland residents, specifically requesting job training and local hiring programs. Tonja Fullerbryant, who works at the Coliseum, added that the plan should "ban the box" (asking about criminal records) from employment forms. "All these people are coming out of prison, you gotta have jobs for them," she said. Some advocates and local business owners also expressed concern that the plan could displace existing businesses. Fred Ellis of the Oakland Works Alliance told the Planning Commission, "We oppose zoning changes that remove East Oakland's business park." Oakland Works members fear that by permitting housing in the Airport Business Park, the plan would drive up land values and push current businesses out. "We should preserve jobs that people actually have," said Kimberly Mayfield of Black Women Organized for Political Action. Community organizations including OCO, CJJC, CBE, and EBHO, studied the draft plan and joined together with unions, faith leaders, and other community groups to form a coalition of a dozen organizations representing "tens of thousands" of Oakland residents. 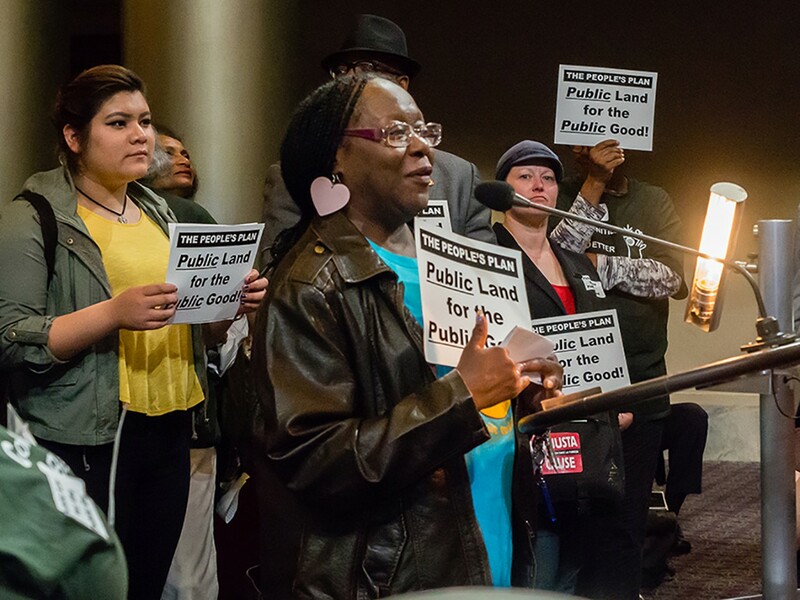 Many East Oakland residents and organization representatives spoke at planning commission and community meetings, met with planning staff, and wrote letters proposing changes. Ed Manasse and Devan Reiff of the city's strategic planning department held public meetings to gather input and in February issued a revised draft including new sections on affordable housing and anti-displacement measures. Advocates expressed their appreciation: "Staff have gone out of their way to hold meetings, and we've seen some of our input go into [the second] version," Imara said. But the community-labor coalition felt the changes didn't go far enough and submitted a list of proposed additions on March 4. Many of those changes were included in the final version of the plan. The planning commission voted unanimously on March 11 to send the plan to the city council for approval. The final version of the plan states that a minimum of 15 percent of the new housing units should be affordable to households with a range of income levels, from extremely low to moderate. The plan also includes measures to counter potential displacement of neighborhood residents, and it proposes extensive outreach to make sure tenants know their rights under city law. The final version also adds policies and includes programs to make jobs "accessible to residents in the surrounding East Oakland area" and calls for "banning the box" on job applications. It strengthens language calling for "project labor agreements," which lead to better wages and benefits. In response to residents' requests for action to reduce air pollution in the surrounding area, planning department staff and commissioners said they will make a priority of rezoning the nearby community to separate housing from heavy industry. The final version of the plan adds more environmental protections and includes more definite commitments to support community benefits, such as the construction of a youth center and health center. Transportation goals were revised to include transit that is "accessible and affordable" to low-income residents, workers, seniors, youth, and people with disabilities. Also added was a goal of providing free transit passes, as both an economic and an environmental benefit. The plan also includes changes recommended by the Landmarks Preservation Board, environmental organizations, and public agencies such as the East Bay Regional Parks District. One proposed change the plan does not address is the call from the Oakland Works Alliance and Airport Business Park representatives to postpone rezoning the land on the bay side of I-880. Commissioners, however, offered reassurance that the plan calls for housing in only one small section near the bay, isolated from the rest of the area. The planning commission also denied a strong request from many neighbors and community groups to raise the goal for affordable housing to more than 15 percent. "That's nowhere near enough," said David Zisser of Public Advocates. "It doesn't reflect the needs of the community, where 50 percent of the people are low- and very-low income." The coalition wanted the plan to adopt goals at least as ambitious as those in official city policy: 14 percent of new housing for low-income people, 14 percent for very-low-income, and 19 percent for "moderate income." Several commissioners agreed that 15 percent was too low but wanted to keep this plan consistent with other recently adopted area plans. In addition, several commissioners pointed to the shortage of funding for affordable housing statewide and expressed concern that setting the goal too high might discourage developers. The plan, however, is only a general framework. "When details are being worked out with developers, we are pushing to have folks from the community involved," said Robbie Clark of CJJC. "And to make sure there's a committee of community folks to monitor how the plan is implemented." "We want this development to bring positive benefits for the community," he added. "That can happen if community folks have input and say-so."